Have you ever eaten underwater? 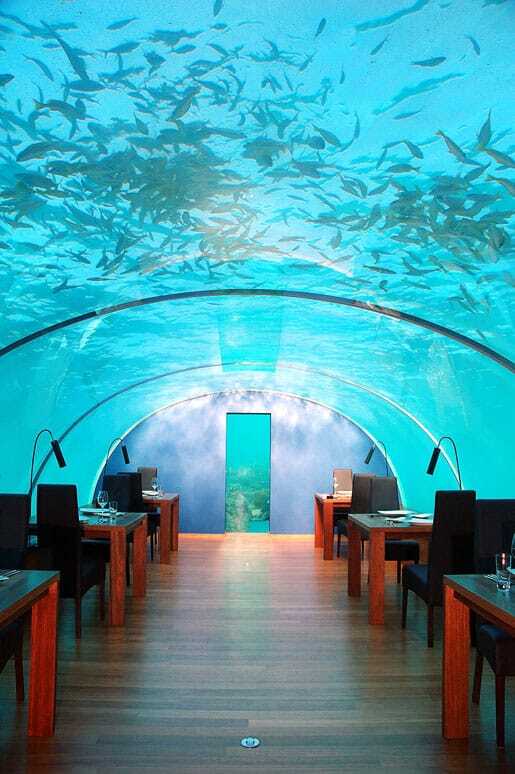 Well, at the Ithaa Underwater Restaurant you can have your chance! 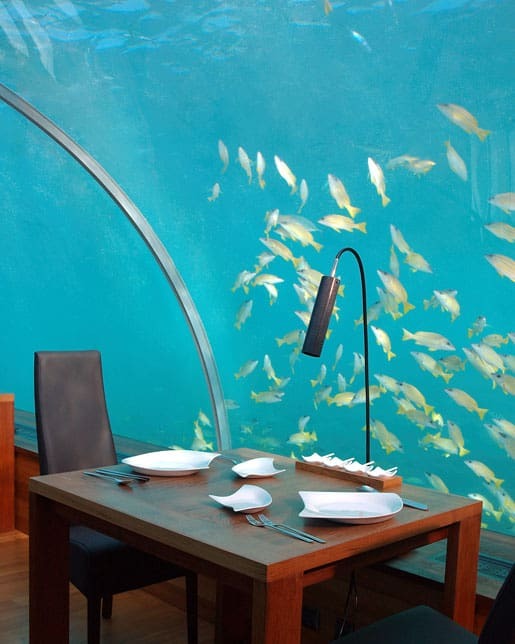 This is a one-of-a-kind restaurant where diners are surrounded by glass, which provides a unique view of marine life while dining. Dining at 16 feet below sea level is something you will only experience while visiting Conrad Maldives Rangali Island in the Maldives. 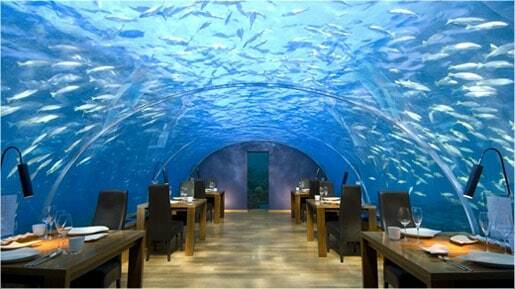 This is a fine dining restaurant, but it is a tourist attraction as well so plan to make reservations well in advance if you want your opportunity to have dinner while enjoying underwater views of the reef and fish swimming by. It is an experience like none other so be sure you add it to your “to-do” list while vacationing in Maldives. While Ithaa Underwater Restaurant would surely be enjoyed by young children, the restaurant does not cater to children under 12 years of age. If you have young children the Ithaa Underwater Restaurant may just have to wait until they are older unless you bring grandma along! Enjoy dining underwater from 11 am until 12 am seven days a week. Keep in mind the restaurant has a “smart” dress code and the menu does change seasonally. There is only enough room for 14 diners at a time so be prepared for an intimate atmosphere and delicious Maldavian-Western fusion meals. Diners should budget $120 to $250 USD for an average meal, and although pricey it is definitely worth the experience to dine inside the aquarium and watch marine life in its natural habitat. I like it. It would be the most remarkable lunch/dinner/meal for me. I will try to make it there once in my life time. how can one enter the restaurant without water gushing in? or there’s an outlet from the island which is 16 feet from ground level?